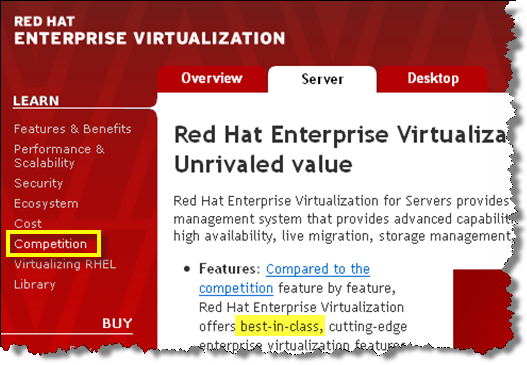 The time has come to wrap up the VCritical series on Red Hat Enterprise Virtualization (RHEV). After having an opportunity to experience that new product firsthand, I felt some of Red Hat’s claims warranted scrutiny. Just take a look at the rhetoric from the Red Hat CEO to see what I mean. The virtualization community certainly responded to the various RHEV articles, and it was great to hear from some new voices as well as the usual suspects in the interesting discussions that ensued. One new commentator in particular, using a pseudonym, provided valuable technical affirmation based on obvious stick-time with RHEV. Unfortunately, some of the commentators did not disclose their affiliation. I was particularly disappointed to see Red Hat employees — or people connecting from Red Hat IP address space — commenting without disclosure. Several opposition voices lost sight of the fact that RHEV is not merely a synonym for open source virtualization, nor is it even equivalent to Red Hat Enterprise Linux running the KVM hypervisor. The discussion did go off on a few other tangents, but overall the conversation remained civil. Red Hat even removed the “Competition” page entirely, throwing a 404 error now instead. Whether or not those corrections were a result of this article series is open to debate. Franky, I have a whole queue of topics left to cover — but the opportunity cost is too high to spend any more effort correcting the range of misleading RHEV claims. Perhaps I will revisit this series with the release of RHEV 3 or RHEV 4 if the accompanying rhetoric warrants it. Don’t forget to check out the RHEV summary page for a quick overview of the whole series.